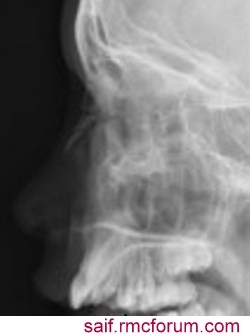 Type-2- The nasal bones are displaced laterally. Type-3- There marked depression. The septum is collapsed. 1) Deformity- Depression or lateral displacement of the nasal bone.External swelling follows quickly due to haematoma and oedema. Which may obscure the bony injury. 2) Pain. 3) Epistaxis– Frequently. 4) Nasal obstruction-Due to dislocation or haematoma of the septum. X-ray nasal bone lateral view. Before swelling appears, the reduction should be done immediately. Either by WALS HAMS FORCE or by digital pressure. under G.A after swelling subside. 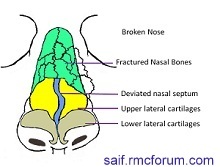 The reduction may be done by either refracture or SEPTO-RHINOPLASTY under G.A. I along with Steven L. Snodgrass, M.D., F.A.C.S. would like to find out how we can obtain permissive use of this photo from your article on this website for the purpose of including it in a book we are writing on Trauma. Any help would be appreciated. 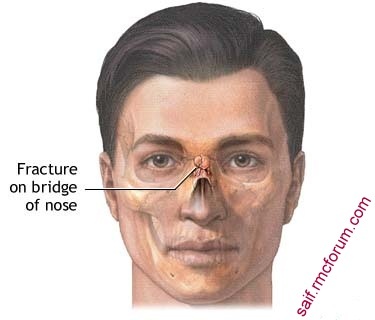 The photo is the “Nasal Bridge Fracture” Please advise permissive use and how credit should be given. Thank you for your time and attention.